Infinixmobility launched another hot-series smartphone which is available in very reasonable price in Pakistan and meet the all high end specs which we will discuss later, the smartphone named Infinix HOT 4. With a diverse range of stylish android powered designs, Infinix Mobility Limited launches another sleek phone to its hot series as Infinix Hot 4 at the best price available in Pakistan. Infinix Hot 4 has plans to blow up the market with its new looks and design. This is a trendy smartphone to buy with advanced features of a 5.5 inches display HD IPS display with an interface of XOS chameleon version 2.0. 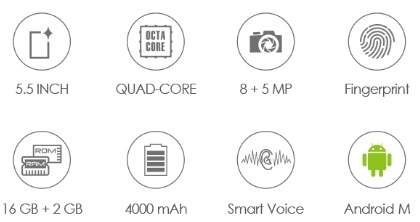 It is powerful with a long lasting non-removable battery to cherish without a pause, like never before. The battery capacity has also been bumped to whopping 4,000 mAh with a promise of two days of battery life. The new Infinix Hot 4 now comes with a fingerprint scanner mounted right under the camera module on the back side. Infinix Hot 4 main processor carries modernized and update components that’s includes 1.3 GHz Quad-Core processor with 2 GB of Ram which makes multi-tasking more reliable. More from the premium features it has dual high-quality stereo speakers for exceptional multi-media experience, Powered by Android M, XOS and advanced smart voice technology. Infinix Hot 4-X557 has 8 Mega-Pixel rear camera and 5 MP front facing camera to capture unforgettable moments.